The first international soccer game played in America took place in East Newark on November 28, 1885. This was no quiet affair. More than 2,000 spectators made their way to a field across the Passaic River from Newark, just south of Kearny. The grassy expanse was home to the O.N.T. Athletic Association, a local powerhouse sponsored by the area’s major employer of Scottish immigrants, Clark Thread Mills. The Canadian national team was visiting, and a squad of all-stars was raised from the industrial teams that played in the area, representing (albeit unofficially) the United States. The American team hadn’t had a chance to practice together, but the players knew one another fairly well. Five were from the O.N.T. club, three came from the Kearny Rangers, two from Paterson’s Thistles and one from the Newark Almas. Both sides played a 2–2–6 formation, with six forwards. The game was rough. A reporter from The New York Times noted that the match devolved into fistfights and shoving matches a number of times. The final score was 1–0 in favor of the Canadians; the goal was scored by Alex Gibson (right). It was the first international match played outside the British Isles. Canada, whose lineup was made up from players in the Ontario Football Association, stayed and played two more matches, defeating O.N.T. and the Almas before heading back north. 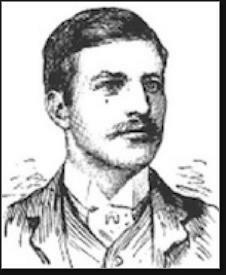 The Canadians returned to New Jersey on Thanksgiving Day in 1886 to play another picked team of Americans. This time they were ready. They recovered from a 1–0 first-half deficit to triumph 3–2 in a driving rain. The three U.S. goals were scored by Swarbick, Gray and McGurk. To most soccer historians, the 1924 Olympics in Paris marked the first truly international soccer tournament. The Uruguayan national team startled European fans with crisp and creative passing on their way to the gold medal. The American squad—including Jersey Boy Jimmy Douglas—finished a distant 9th, managing one victory, against Estonia, before falling 3–0 to Uruguay. When Uruguay took the field at Newark’s Davids Stadium (later renamed Ruppert Stadium) in the spring of 1927, they hadn’t lost since their last meeting with the Americans. This time the supremely confident visitors faced the Newark Skeeters, cheered on by 5,000 spectators. The Skeeters were nothing special—they were one of the least successful teams in the American Soccer League. 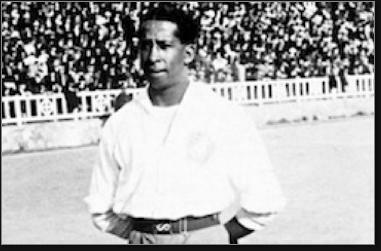 The talk of the town that day actually was the 25-year-old Jose Andrade (left) aka “La Maravilla Negra,” who had established himself in Paris as the sport’s first black superstar in leading Uruguay to the championship. It was the third match of a 13-city tour for Nacional. Ten minutes into the match, things began to go unravel for Uruguay when two defenders sandwiched an American player in the penalty box and were whistled for a foul. After arguing unsuccessfully with referee James Walder, the outraged players threatened to leave the field if the Americans scored. Jock Marshall took the penalty kick and purposely booted it wide so the match could continue. Alas, it was not Uruguay’s day. Jack Renfrew scored a clean goal, sending the crowd into a frenzy. Minutes later, the American’s made a hard foul on Hector Castro, who had been using the stump of an arm he had lost to an electric saw at age 13 to bludgeon his defenders. With the Uruguayans desperate and angry, Pedro Cea was whistled for a foul and became so incensed that he punched the American player on the ground. The fans swarmed on the field and a free-for-all ensued. After order was restored, keeper Tommy Murdoch stopped everything that came his way and the game ended 1–0. When Pele concluded his 19-year career with the Brazilian club Santos in 1974, soccer fans believed he had nothing left to prove. They didn’t know Pele. He believed that America was the sport’s sleeping giant, and to jostle it into consciousness he un-retired and joined the New York Cosmos of the North American Soccer League for the 1975 season. 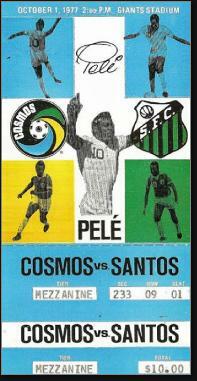 Public awareness of soccer skyrocketed during Pele’s three seasons with the Cosmos, who moved to Giants Stadium in 1976. Youth soccer programs exploded in the decade after his arrival. As Pele’s third season drew to a close—a season that saw the Cosmos win the NASL title—he decided his work here was done. He decided to retire during the October 1st “friendly” between the Cosmos and his old club, Santos, in the Meadowlands. Every seat in the stadium was sold, and the game was televised in America on Wide World of Sports, and to virtually every soccer-playing country in the world. Pele suited up for Santos in the first half and scored the 1,281st and final goal of his career, rocking Giants Stadium. He played the second half in a Cosmos jersey, helping the team win 2–1. Pele’s final lap around a soccer stadium was completed without his feet touching the ground. Cosmos goalies Erol Yasin and Shep Messing carried him all the way on their shoulders. During the final minutes, a steady rain began to fall. Soccer fans liked to say the sky was crying that day. Pele himself was unable to hold back the tears during his own farewell speech. When FIFA announced that the 1999 Women’s World Cup would be held in the U.S., the Team USA players wondered how on earth they would fill the stadiums lined up for their games. Women’s soccer had only recently hit the American sports radar after Mia Hamm led the squad to a gold medal at the Atlanta Olympics in 1996. The opening game of the 1999 tournament was scheduled for Giants Stadium against Denmark. Interest for the match had been building for weeks, but the players were completely unprepared for what the encountered when they emerged from the dressing room. Every seat in the 78,972-seat building was occupied by a screaming soccer fan. They could feel the ground shake and the cheers beat against their chests. Women’s soccer was officially on the map. Their astonishment showed early in the match. They gave away several balls at midfield and allowed a Danish forward to sneak past the defense just a couple of minutes into the game. Fortunately, she missed wide-left. In the 17th minute, Brandi Chastain chipped a pass to Hamm, who popped the ball over the head of a defender to herself and then scored on a left-footed drive. Team USA’s onslaught continued. The final 3–0 score hardly hints at the team’s superior end-to-end play. Julie Foudy and Kristine Lilly scored late to give the Americans a cushion. The attendance figure of 78,972 established a world record for the most fans ever to attend a women’s sports event. At the time it was also the largest crowd ever to watch a game of any kind at Giants Stadium. The U.S. women went on to win the World Cup a few weeks later against China—a moment made indelible by Chastain’s iconic celebration after her game-winning penalty kick. With World Cup 2010 on the horizon, the U.S. men’s soccer team was gearing up to begin the qualifying process with a “friendly” match against Argentina, the #1 ranked team in the world. U.S. soccer fans were expecting a drubbing, but hoped that goalkeeper Tim Howard—a Jersey Boy—might keep the score close. The draw of soccer’s top team and the growing popularity of soccer in America drew a crowd of 78,682. Fans cheered Landon Donovan prior to kickoff. He was playing in his 100th international match. As expected, forwards Sergio Aguero and Julio Cruz led an attack that peppered the U.S. goal with shots in the opening half. But Howard stopped all seven on goal, including two by Cruz on the same point-blank play. Howard stopped Cruz again at close range after Cruz received a perfect pass from Lionel Messi. Howard stopped another Messi-Cruz combo near the end of the half. Buoyed by his performance, the U.S. defense tightened in the second half, shutting down the passing lanes and anticipating beautifully. The Argentines managed just a single shot in the final 45 minutes, and it sailed harmlessly over the back line. This despite playing a man down after a red card. The final score of 0–0 was as good as a win for most American soccer fans. And Team USA almost pulled off a true upset. A first-half shot by Clint Dempsey missed by inches.